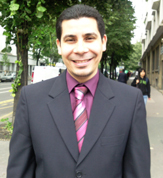 Wissam Mallouli is a Telecommunication Engineer graduate from the National Institute of Telecommunication (INT) in 2005. He received his Masters degree from the Evry Val d’Essonne University also in 2005 and his PhD in computer science from Telecom and Management SudParis (France) in 2008. He is currently a research & development engineer at Montimage France. His topics of interest cover formal testing of functional behaviors and security aspects of distributed systems and networks. He worked in several Europeen and French research projects.